The Mini Feather Chameleon mobile has proven to be one of our most popular smaller metal mobiles over the years. 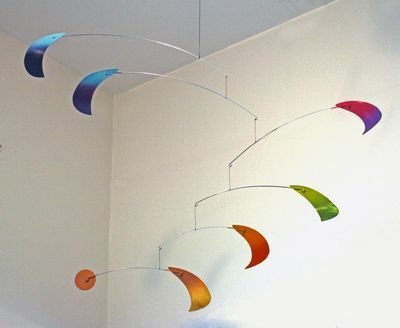 Being slightly smaller than our Full-Size Feather mobiles, the Mini Feather Chameleon incorporates 6 armatures with 2 different color combinations transitioning into each other on each curved vane. The mobile measures slightly smaller than the full-size Feather mobiles for easier placement within a home at 22"H x 38"W. Signed and dated by Joel Hotchkiss. For indoors only.